Tomatoes are one of the most popular crops to grow in the home garden, sometimes with less than desirable results. To boost your yields, you might try companion planting next to tomatoes. Luckily in the case of tomatoes, there are many suitable tomato plant companions. 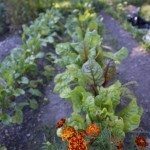 If you are new to companion planting, the following article will give you some insight into plants that grow well with tomatoes. When we are talking about companions for tomatoes, we aren’t talking about the type of support humans get from friends and family, but in a sense, maybe we are. Companion planting is a form of polyculture, or using multiple crops in the same space to the mutual benefit of each – much as humans benefit from those we interact with. These benefits include pest and disease control, aid in pollination and offering refuge for beneficial insects, all of which will increase crop yields. Companion planting also increases the diversity of the garden, much as mankind’s diversity has been increased with various ethnicities, religions and cultures. This merging brings out our strengths but it can also bring out our weaknesses. The same is true when growing tomato plant companions. The right tomato companions will engender a healthier plant with better fruit yields. The wrong tomato companions can have disastrous results. Plants that grow with tomatoes can include vegetables, herbs and flowers. Plants that grow well with tomatoes include all the members of the onion family such as chives, onions and garlic. Their pungent odor is said to deter insect pests. Peppers, both sweet and hot, are excellent companion plants. Probably since they are related; they are both in the nightshade family. Many greens, such as spinach, lettuce, and arugula, enjoy the company of tomatoes and benefit from the shade provided by the taller tomato plants. Carrots are also plants that grow well with tomatoes. Carrots can be started when the tomato plants are small and will grow in conjunction and are then ready to harvest about the time the tomato plants are taking over the space. Asparagus and tomatoes, when planted together, get mutual benefits. For the tomatoes, the close proximity of asparagus wards off nematodes and for the asparagus the nearness of tomatoes repels asparagus beetles. Parsley and mint are also good companion herbs for tomatoes and deter a number of pests. Basil is also a favorable plant to grow near tomatoes and purportedly increases not only the vigor of the tomatoes, but their flavor as well. Flowers such as marigolds keep nematodes from attacking tomato plants and their sharp odor confuses other insects. Nasturtiums help to deter whiteflies as well as aphids. Plants that should not share space with tomatoes include the Brassicas, such as broccoli and cabbage. Corn is another no-no and tends to attract tomato fruit worm and/or corn ear worm. Kohlrabi thwarts the growth of tomatoes and planting tomatoes and potatoes increases the chance of potato blight disease. Fennel shouldn’t be planted near tomatoes, or near much of anything else actually. It inhibits the growth of the tomatoes and many other types of plants too.